Welcome to the tenth edition of our weekly curated news article where we provide you with the widest possible overview of the most important events that have transpired in cryptocurrency and blockchain developments. We’ve made sure to analyze all of the news reports available on the internet and reviewed them for relevancy. This article is best suited for weekly and swing traders as well as crypto enthusiasts with a packed schedule that want to satisfy their interest in cryptocurrency and blockchain with a minimal time investment. This week, the Argentinian government to match Binance Lab’s investments in local startups up to $50k USD. Long Blockchain is getting the dodge out of the iced tea business. One OneCoin founder and leader charged and arrested in the US, another at large. Brazilian court rules in favor of crypto exchange in lawsuit involving a local bank. Digital Token Act signed by Colorado governor. Blockchain ETF launched on the London Stock Exchange. EU Report suggests that permissioned blockchains will play a much bigger role in mass adoption as compared to decentralized blockchains. 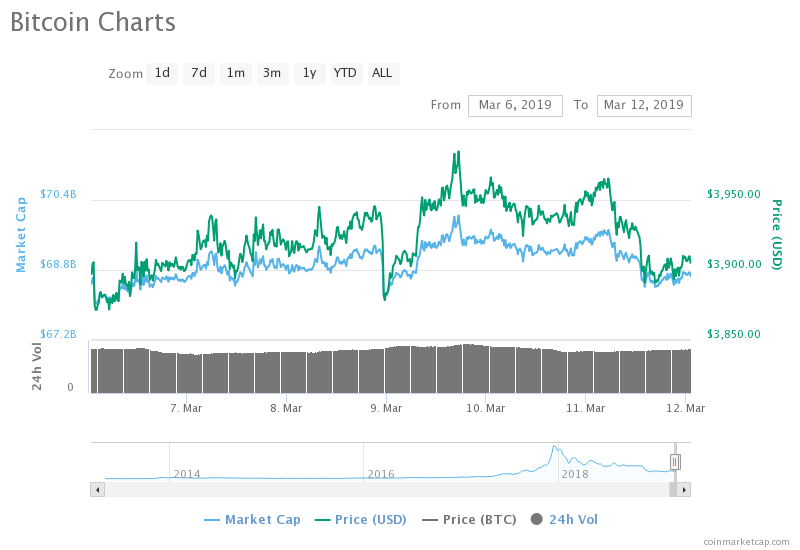 Bitcoin’s price has seen some positive activity over the week with an uptrend in its price. A sell off caused the price to drop on the 9th of March, but it regained the position by the end of the day, and went even further. It tested the $4000 mark, but has failed in getting support to remain at that level, and has fallen down to $3900 by the end of the week. The price movement does not reflect the nature of the news, leading us to believe that the price movement this week is speculative. Binance Labs recently set up an innovation hub in Argentina’s capital Buenos Aires, and this has prompted the local government to support the development of local blockchain startups. They have announced that they will match any investment in Argentinian startups by the incubator with an investment of their own, up to $50k USD. This is an applaudable decision by the Argentinian government, one we believe will yield an increasing interest in blockchain technology by the local startup scene, and with that the rest of the country. During the 2017 crypto hype, several companies around the world changed their names to incorporate blockchain in their official names. One of them was “Long Island Ice Tea”, which changed its name to “Long Blockchain Corp.” As a result of the ridiculous name change, their shares rose up by 289% for a short period of time. The price of the corporation’s stocks has fallen down to levels lower prior to the name change, and it’s stocks have been removed from NASDAQ’s stock listings. However, the corporation is not dissuaded by the harshness of the situation. Instead, they have decided to completely sell off the Iced Tea part of the business and dedicate all resources to blockchain technology. Questionable decisions have been made in cryptocurrency and blockchain, but it definitely takes some courage to make a pivot like this and face the resistance. While it is unclear how much money was actually “invested” in OneCoin, the fraudulent cryptocurrency project is thought to have attracted billions of dollars from its victims. Based only on lies, deceit, and the predictability of human behavior, the projects founders and recruits promised high returns and minimal risk. However, this was all “smoke and mirrors” according to Manhattan U.S. Attorney Geoffrey S. Berman. The organizers of this pyramid scheme took advantage of the hype that was associated with cryptocurrency. They convinced investors that they have a chance to experience what was at the time happening to Bitcoin and Ethereum. Most of the investors did not understand blockchain and cryptocurrency. They could not see that OneCoin was a fraud, even though this was easily checked by a simple google search. Which brings us to the main point. Investments are risky, but they need to make real sense. Most scams work, mostly because of people not willing to learn and understand more than they do. Most people want to keep it as easy and smooth as possible, making them perfect targets for a malicious project like OneCoin. After receiving fraudulent transaction attempts, Banco Santander closed the accounts of Mercado Bitcoin. However, these attempts were made by third parties, i.e. the customers of the crypto exchange. Pursuing legal action, Mercado Bitcoin filed a lawsuit against the bank. The court decided in the favor of the exchange, but the bank protested this decision asking for a second hearing. According to them the business was operating against the bank’s policies, but the court ruled that the cryptocurrency exchange cannot be held liable for the actions of individuals that are not representing the company in any capacity, and as such the bank has no authority to freeze their accounts. Brazil is an interesting location for cryptocurrencies. They remain unregulated and scrutinized by the law. At the same time, court decisions like this with no apparent bias for or against cryptocurrency is a great sign. While regulations may be far away for Brazil, the adoption and understanding of the social layer of the country is commendable. Many other countries have no regulation, however companies are not allowed to have bank access if they are working in the crypto industry. Such examples include big countries like China, and small ones like Macedonia. The first step towards complete integration of cryptocurrencies in Colorado was undertaken with the signing of the “Colorado Digital Token Act” which comes into action on the 2nd of August 2019. The bill explains the status of Colorado as a hub for companies and entrepreneurs that want to utilize cryptocurrencies and blockchain systems to power blockchain-based business models. The bill explores the intention of cryptocurrency and how some models can be exempt from the state’s securities considerations. It also explains that the current regulatory stance, i.e. the cost and complexity of the securities registration. It will allow for greater clarity for businesses looking to use cryptocurrency to raise capital, with the possibility of being exempt from registration if a securities commissioner provides acknowledgment of the intent of the digital token in question. The senate hopes that this bill (with limitations to protect consumers) will result in better conditions for businesses in Colorado. This will spark more innovation and growth, create more job opportunities for citizens, as well ensure Colorado’s growth as a hub that supports the development of “Web 3.0” companies. This is not the long awaited Bitcoin ETF that the likes of SolidX and VanEck are proposing to the SEC. It is however an interesting step that increases the legitimacy of the blockchain industry, and could prove profitable for many investors in the U.K. The U.S. based investment company is launching a blockchain exchange traded fund (ETF) which will be targeting 48 companies involved with blockchain technology. Selected with the help of Elwood Asset Management, the list includes high-tier companies like Apple, Intel, AMD, cryptocurrency exchanges, as well as JP Morgan Chase. The ETF is already active on the stock exchange and trading at $40.63 USD per share. There is a total of 500,000 shares, at an estimated value of $20 million. The starting price was a flat $40 USD. It is unclear whether this company portfolio will contribute towards the eventual creation of a pure Bitcoin ETF on the largest market in the world. What is clear is that investors have a new, reliable opportunity to invest into blockchain, without the risk of getting scammed, or owning worthless tokens. How did OneCoin defraud billions out of investors? Coming from the core of decentralized systems created to emulate the way that Bitcoin works, it is difficult to face the reality of mass adoption. Cryptocurrency has already cost thousands of naive investors, billions of dollars in losses. As such, this report comes at no surprise to us. The latest report titled “Scalability, Interoperability and Sustainability of Blockchains” provides the perspective that the first wave of mass adoption will happen because of permissioned blockchains with a specific use case. The report is a nice read, and can be found here. Many issues plague decentralized blockchains (and with good reason), as they do provide us with the many benefits, which are simply not present in permissioned systems. However, these also drive up the cost of the systems, often making them economically unsustainable to operate. As such permissioned blockchains are expected to play a bigger role in the mass adoption of blockchain technology. However, permissioned does not have to be insecure. Interoperability is a very important topic, which can enable smart contracts to be built between different permissioned blockchains, creating a clear trail of communication between various entities. Blockchain is set steady on the path to completely remove any form of unnecessary paper-based recording of information, to alleviate the burdens of safeguarding and automate the writing of history. Unfortunately, permissioned blockchains also have flaws, as malicious actors could easily abuse them, similar to how certain politicians and officials are able to abuse their positions of authority.